Address: 3595 S. Las Vegas Blvd. Restaurants : Victorian Room, Michael's. Standard room amenities : cable tv with plasma screen, AC, hair dryer, iron, PPV movies, refrigerator, telephone with voice mail. 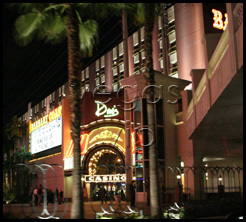 A veritable sleeping giant among smaller hotels, the Barbary Coast packs a punch with its exceedingly popular restaurant and after-hours club -- Drai's. Not to mention, it’s located right in the middle of all the action. 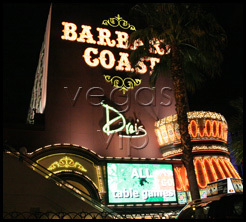 Set into a cross-section between Caesars Palace, Bally's and Bellagio, the Barbary Coast sits upon the throne of the Strip, sharing space with some of the best. With just 200 rooms, the Barbary Coast can afford to lavish guests with unbridled attention to detail. And with more than 900 slot machines, the casino is busy around the clock. However, even with all its luster, it is Drai's that makes the greatest impression at the Barbary Coast. Run by Victor Drai, this elegant eatery serves exquisite French cuisine in an environment of candles, mirrors and rich red colors. Drai's is quietly known as one of the best restaurants in the city.